Flipped is likely a film that has gone unnoticed by many. It has had a weird distribution schedule considering Rob Reiner is its director and its coming from Warner Bros. It hit a few screens, very few, on August 3rd and made a wider release without much fanfare on August 27th. It’s quite unfortunate too because this is great little heartfelt film that is sure to have an emotional resonance with audiences of all ages. Hopefully, once it hits video more people find out about it. Flipped while telling a seemingly simple story of a protracted relationship between neighbors Bryce (Callan McAuliffe) and Juli (Madeline Carroll) it tells the tale from the perspective of both the male and the female, here we get the truest illustration of the now cliché that men are from Mars and women are from Venus as they are rarely on the same page. However, their perspective on each of the major events of the tale is very interesting indeed. While it does seem at first like it is a narrative device which is being used simply for you to get to know the characters it quickly becomes the signature of the film. It is slightly unconventional and so it may not be an unusual reaction to be waiting for a more traditional narrative structure to take hold but eventually I did find myself awaiting the visual flip in which the story switch to the alternate narrator for a chapter and part of what becomes so engaging about it is that you start to identify at some points with either side of the seemingly star-crossed lovers. It therefore becomes a very emotionally involving experience and to an extent and intellectually stimulating one whereas you see a scene play out and know the opposing party will have their own version of the events and you wonder what that might be. A great surprise that this film has in store is at the end when their feelings are mutual is when the narrative divide is crossed and they speak in the same segment both of them telling the story. It is a wonderful break from the myopic views as they now are sharing a moment they’ll both remember with equal fondness. The film in the latter stages does become manage to become very moving and by then the characters have been built so well you want for them and might even feel your eyes stinging with tears. What is most fitting about the ending is that it is done telling the tale and that is all. There is no “happily ever after” it can be implied if you wish it or not the story at hand was about the beginning not the end so why venture a guess. In the end the ebb and flow of the film was quite satisfying and there was likely something most people could relate to regardless of the construct of this particular tale or the period it is set in. This film being a period piece was a decision that Rob Reiner came to and one that was not suggested by the novel and it was a good decision as the story itself does ring a bit more true being set in the past than it would in the modern-day. Particularly due to the connection that Bryce’s grandfather (John Mahoney) and Juli have. While this does allow for a few things that make you wonder if they are accurate like dinner table conversations about salmonella and the prices of things it is ultimately a change for the good. What is perhaps most interesting in this film in that because it has two protagonist/narrators thus it focuses on two family units and it does manage to give us some understanding as who all these characters are and allows for great dramatic scenes amongst the family units. The cast is impeccable all the way to the smallest player like Juli’s older brothers who not only look the part of aspiring doo wop singers but sing the part as well. However, the glue that holds the film together can be found in its young leads Callan McAuliffe, who not only convincingly plays a somewhat naive well-intentioned boy but also has no remaining trace of his Australian accent throughout and Madeline Carroll who is like a young Ellen Page. This is a throughly enjoyable, heartfelt, funny and endearing film that you should make an effort to see. The final element that needs discussing is the park itself, a realization of Hammond’s dream that we had not yet been privy to see. 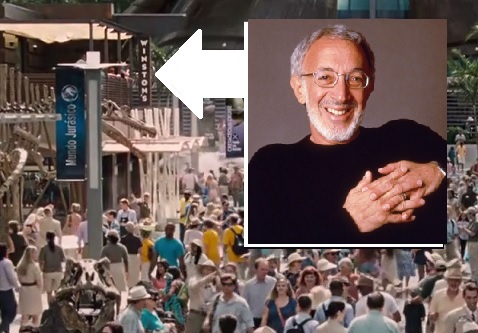 The camera move into the hotel room, chasing Gray (Ty Simpkins) all along, out to the balcony and looking out across the aquatic center and the Hammond building has a very similar effect to the first view that Ellie and Dr. Grant have upon first seeing the Brachiosaurs, and this is not just because of the use of Williams’ iconic theme. Sure, it’s the kind of wonder a kid has at Disney World, but the Disney parallel has always existed; and the exuberance on display is no less pure in this scene than there in the real world. Though, yes, this is the movie part of the illusion it’s trying to create is that these dinosaurs exist not just in modern times but in the world today. What would a multi-million (billion?) dollar a year theme park full of dinosaurs look like if not something corporate? The selective nature that goes into deciphering what product placement is distasteful or gaudy absolutely confounds me. The park’s vehicles are now Mercedes-Benz, in the first film they were Jeeps, so that makes it an advertisement. 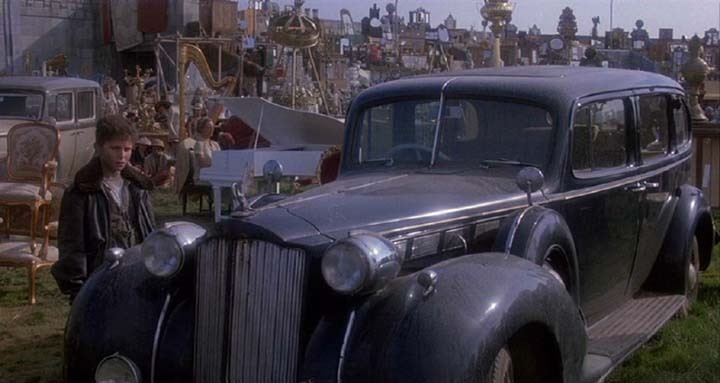 Yet it seems when certain vehicles are used because they represent an era like Mercedes being used by the Germans in WWII or the tracking shot keeping the Packard hood ornament in focus during Empire of the Sun mum’s the word because that’s an artful choice. When many complaints about modern CG decry the crushing of verisimilitude it’s odd that an artifice such as Greeking, or obscuring logos and brand names, would be so prized that its mere presence is an instant distraction and detriment. There’s a Starbucks on Mainstreet USA in The Magic Kingdom. Surely, since that was not always the case some were right to be a little peeved by it, but it’s a bit disingenuous. Disneyland and Disneyworld have always been interested in revenue, so that’s a natural progression. Jurassic World has to have a modern corporate mindset to a fault. So, yes, scoff a Brookstone being there if you like but don’t mock that and miss that a restaurant was named Winston’s, in honor of the late, great Stan Winston, and don’t be so busy being annoyed the presence of corporate logos that you miss that there, too, are commentaries like with Pandora, a jeweler I highly doubt was chosen by accident. Especially since one of the things the film is commenting on is corporate influence and it’s open about the fact. Lowery (Jake Johnson) jokes about the dinosaurs being named after companies being the next step after Verizon Wireless presents The Indominus Rex is announced. Furthermore, there is InGen who is always plotting separate deals in the background whether its good for the park or not. They do what’s best for their brand, or more to the point their bottom-line. If the film was called Jurassic Game Preserve, I’d understand the complaints, but since it’s a theme park it makes perfect sense. You can’t get away with charging $7 for no-name soda. No, Pepsi is not OK. Coke, please. And make it a big one so I can nurse it through yet another viewing of Jurassic World.